My friend Gianluca invited me to go with him to the country on last Saturday. The outlook was that it would rain a lot the next day and I was a little dubious about the proposition. He said that it will be raining less in the mountains. Sunny, he said. So I met him at the train station at 8:30 to take the train to San Benedeto val di Sambro, near the border between Emiglia-Romagna and Tuscana, about a 45 minute trip. His sister Analisa met us at the station with her two girls, Dascia and Serena. We went to the little town (Lagaro) near where they lived to do a little shopping and a tour of the town that took about 3 minutes – it’s really that small. Oh, yes, about that rain. It was really pouring down in Bologna and in the mountains? – it was really pouring down! I told Gianluca that I could never trust him again – tongue in cheek of course. Next we went to the house where they lived in the country. At their house I met the dog Tequila which barked at me whenever I showed my face and Raul her husband. They have a fair amount of acreage with geese, peacocks (! ), chickens, a horse, a hamster and, of course the barking dog. Later I also met Raul’s mother who lives in an apartment downstairs and Raul’s sister Barbara who came by to give a haircut to Gianluca. They prepared a lunch. Raul prepared pasta carbonara and gave almost everyone a portion large enough to live on for two days. Being the guest I ate it all even though it was a bit much. Then we had some veal in an italian style, pounded thin then breaded and fried. Everything was indeed delicious. With the rain we were a bit constrained but after a while I got a little twitchy just hanging around inside the house so we went for a walk. I had bought a nice big umbrella in Bologna and it really paid off; I hardly even got my shoes wet in the downpour. I saw the horse only from a distance since she was reluctant to come out of her stable in the rain. While there Gianluca offered me a little something to smoke to let’s say, change my perspective. I accepted the offer. I didn’t know how well I’d be able to speak Italian in that frame of mind but perhaps I could speak the language better. When I first heard Dascia’s name I asked her jokingly if she were russian. No, but the name is. Raul told me that when he did his service in the army a friend of his had a wife (or sister?) named Dascia and they liked the name and gave it to their first born. 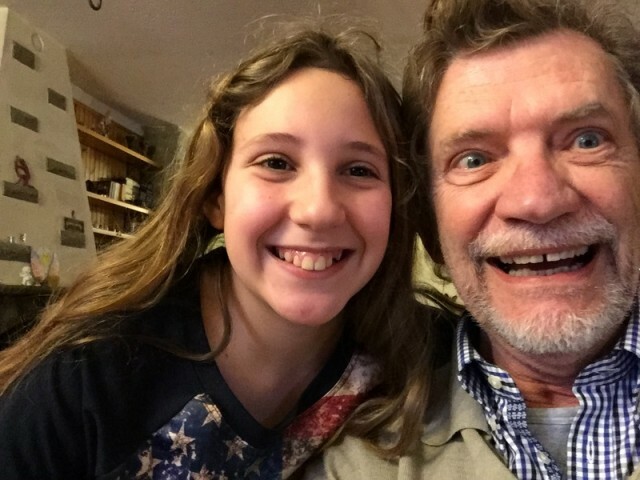 She’s now 12 (and 1/2 she added) takes english in school but was too timid to speak it. She also takes french and said that she didn’t speak that at all well either. No such story with Serena who is 11. Both cute and lively kids. We hung around the house for a little while and then Raul offered to take us somewhere more interesting to pass a little time so we went to a bar in a little town not far away. On the way we passed through a really tiny town. About as small as one can be to merit a name and a sign that shows that you are entering the town and another with a red slash that indicates that you are exiting the town. I joked with Giancarlo that it was a “one ciao town”. That is if you say ciao in the drawn out way that they announce a goal in soccer you could say both hello and goodbye with a single word. Of course you must know that “ciao” (like “aloha” in Hawaiian) has the meaning of both hello and goodbye. I thought it was funny but then in a certain state of mind a lot of things seem funny. Anyway, the bar was quite a scene. 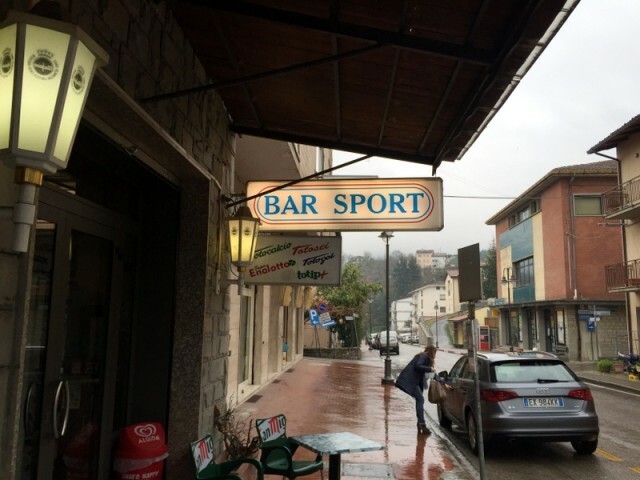 It’s like I’ve so often read the bar is such an important part of Italian life. People go there to have coffee, a drink of anything from beer to whisky, play cards, even gamble a little in some places. It’s a center of social life, especially in smaller towns. That was certainly the case there. We hung out there for awhile and Raul knew pretty much everyone that came in. He was born there and like most small towns everyone knows everyone else. I found it really interesting. Then we went to another bar that had a little (and I mean little) aperitivo buffet. Fewer people came there but again Raul knew everyone. We managed to kill enough time to make it feasible to go to dinner. We wanted to go a little early so that we could have an unhurried dinner and still be able to catch the return train at 9:40 back to Bologna. Giancarlo had promised me a really good meal in a local restaurant that was much cheaper than any equivalent in Bologna. So Raul dropped us off at the restaurant and went back to the house to get Analisa and the girls. 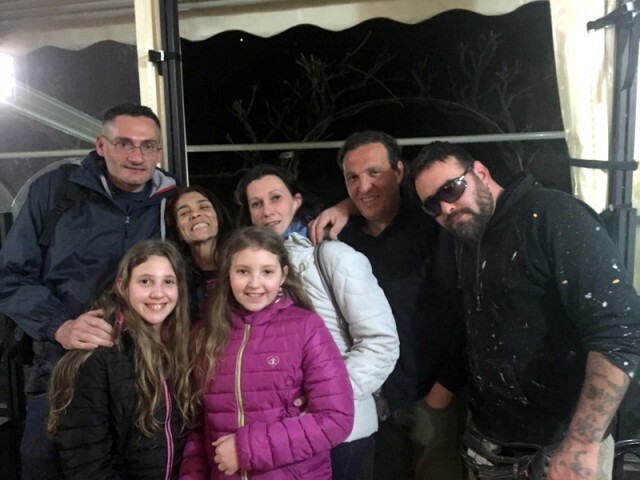 We were later joined by a couple of friends of Giancarlo who live in Bologna but have an inherited house in the area. So we had a nice dinner. I was not disappointed. I had pappardella con cinghiale (broad fresh pasta with wild boar), Serena had tortelloni (well, big tortellini) with, I think, a light tomato sauce and all of the others had pizza. Of course there was a liter of red wine and also water and Raul, Gianluca and I had a grappa at the end of the meal. I tasted a little pizza as well as one of the tortelloni and it was all good. The total for me (others paid for the wine and water) came to 11 euros. Quite a bargain compared to Bologna. From the left in back: Gianluca, Barbara, Analisa, Raul (a man of few words but a nice guy), strange dude who’s Barbara’s boyfriend. And of course in front, Dascia and Serena. Knowing that the train as at 9:40, at 9:10 I said to Giancarlo that we really need to start thinking about leaving before long. He said, not to worry, the station is only 5 minutes away. As the minutes ticked away I started to worry a bit since the following train is an hour later. So finally at 9:20 I said, “look, we need to pay the bill, I want to take a photo, we need to drive to the station and buy the tickets, so let’s go!”. So we did all of the above and Analisa drove even faster than usual and we go to the station with 3 minutes to spare. Gianluca was buying tickets from the machine as they were announcing the incoming train and the ticket machine gave a message something like “that function is not available” when he pressed the final button to buy the selected tickets! Eeek! So we got on the train and found the conductor. 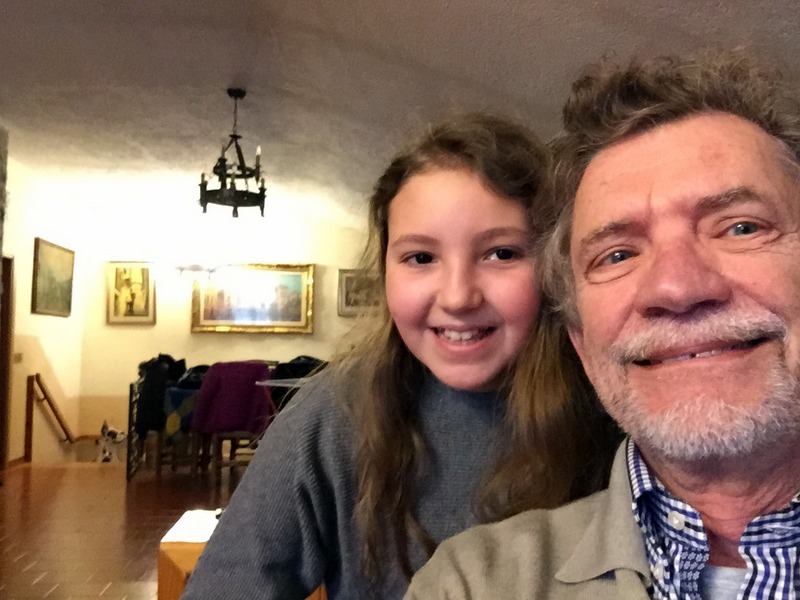 He said you have to pay extra if you pay on the train but Gianluca explained the situation using the usual italian wiles and we paid the standard fare and collapsed into nearby seat – both of us were pretty exhausted from the day. I arrived back at Bologna at 10:30 and just missed the bus that takes me to my neighborhood and had to wait half an hour. Arriving home at 11:30 I happily fell into bed and slept until 10:30 the next morning. I guess I’m finally done with the jet lag. All in all it was an exceptional day and experience for me. I struggled a bit with the local accent but spoke a lot in italian since nobody other than Gianluca speaks much english. I learned a useful phrase from Gianluca which I really like: “a chi se ne frega” which is like “who cares” or maybe even “who gives a damn” – the tone of voice matters. This entry was posted on Wednesday, April 8th, 2015 at 6:21 am	and is filed under Culture, Food, Language, Travel. You can follow any responses to this entry through the RSS 2.0 feed. You can leave a response, or trackback from your own site.